Although it’s taken time, dedication and perseverance, it’s totally doable to launch your own business on Amazon alongside other responsibilities. My main aspirations were to learn more about being an Amazon seller (it’s pretty insightful for my role as part of the JS team), and to build our publicly launched FBA business to raise more money for charity. But that’s just me. What about you? I’ve met so many sellers with different stories to tell. People who wanted to quit their job, who wanted to travel more, who wanted some extra income on the side or even prepare for retirement. So with a full year of launching and scaling done, it’s time to review our MDCS progress. Greg and myself wanted to share a top level overview of the financials, what went well, what didn’t and what we’re planning on doing next to reach our $1 million goal. 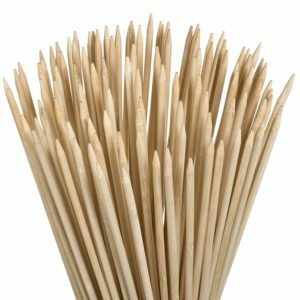 We started this FBA business back in 2016, when we launched Jungle Stix, which is still an extremely successful product. Since then, we’ve launched a second product, Jungle Snugs, and have a third about to launch in the UK (my sleeping bags, Jungle Slumber). Nearly half a million dollars, hopefully by the new year we will be about to hit that mark, or early in the new year. So as you can see, the business is growing nicely too. These figures are pretty much on track with Greg’s targets. Remember that this revenue comes from just two products! Another thing we noticed when digging into our financial metrics in Fetcher, was that sales are growing over time, and seasonality is low. This is great because it means our products are pulling in year round sales. It’s also pretty insightful to look at this data once you’ve been selling for a year or more, to identify when your peak selling seasons are, if you have any. Is it Prime Day? Black Friday? Christmas and New Year? It can vary depending on your product niche, and sometimes the data can surprise you. For us, the Jungle Stix tends to really fly out around September and October. 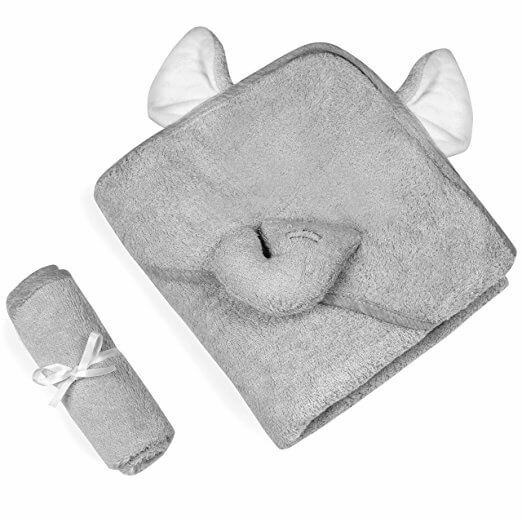 Jungle Snugs only launched this year, but early holiday season sales suggest that Q4 is looking promising for these baby hooded towels. As you can see, order fees are the highest. Whilst this is normal for most FBA businesses, we also have slightly higher fees because of the Jungle Stix. These are an oversized product and therefore have higher FBA fees. It is also our most successful product that brings in a lot of profit… so that is a testament to the fact that high fees does not always equal low profit. If you have been following the case study you will have seen us find and verify each product that we have launched, and a big part of this step in the journey is to do some profit calculations and ensure that the product is going to be profitable on an ongoing basis. Jungle Stix is, therefore Greg isn’t too worried about the high fees for this product. It’s just part of doing business on Amazon! The cost of goods accounted for 18% of our expenses. The sleeping bags that I am about to launch next year are going to be the most expensive product we have launched from a cost per unit perspective. But again, we’ve done our research, we’ve done the profit calculations, and we’re as confident as we can be with our investment. 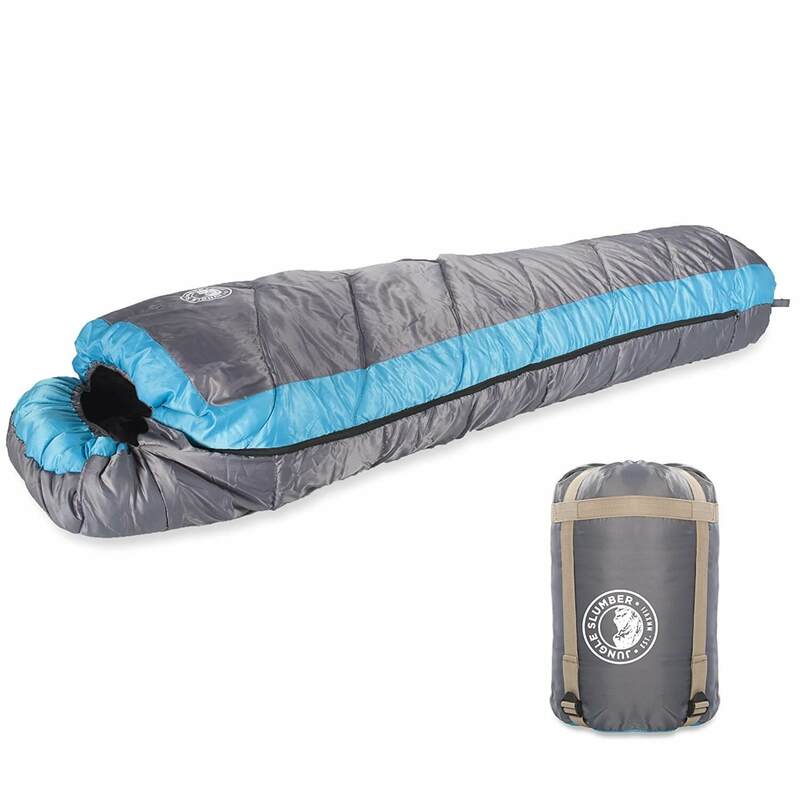 My sleeping bags have a slightly higher cost, but the FBA fees aren’t too high. Ultimately, every product is different, and ensuring each one is profitable is what counts. 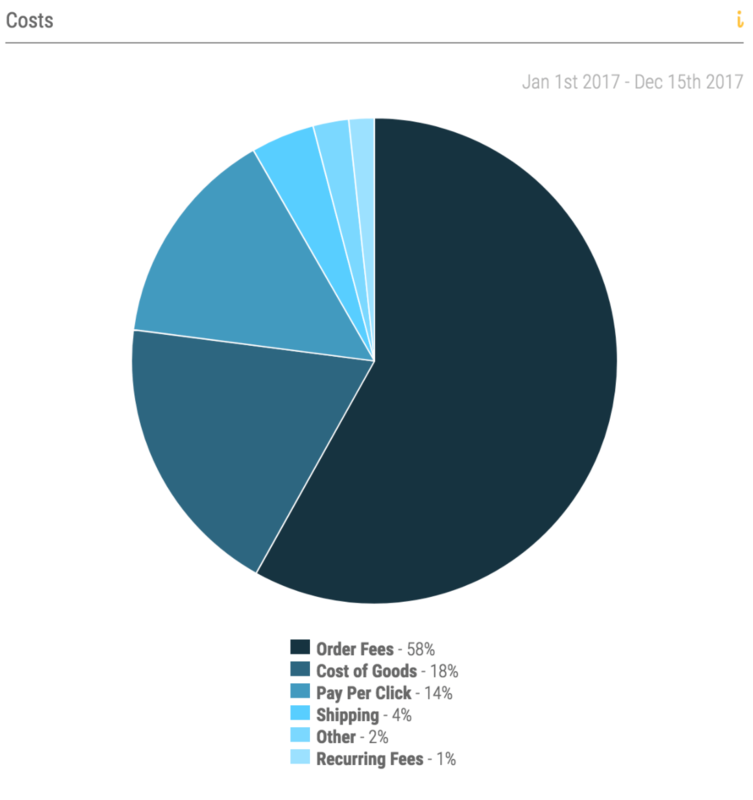 Our PPC costs came in at 14% of our overall expenses, which actually isn’t too bad considering the competitive nature of our business. Since we have been launching products publicly, we’ve had tons of other sellers launching with similar products and therefore we’ve had to be quite aggressive with our PPC marketing. Many sellers worry about shipping costs and how this impacts their FBA business, but as you can see, ours are comparatively low. This proves that even if you use a slightly more expensive forwarder (that is reliable and efficient), your shipping costs do not have to be prohibitively high. I know when I was starting out I expected shipping to account for a higher percentage of expenses than this, so it’s really insightful to get a real life example of what an Amazon businesses expenses look like. So how have our products fared on their own? As I mentioned, Jungle Stix is still our biggest seller. But the snugs are also contributing significantly to the business and still growing. The Stix have generated $185k in revenue this year, of which $38k is profit and the profit margins are at around 20% on average. Margins have actually got better over the past couple of months at about 25%, but this is a year to date view. Greg mentions that 20% is pretty normal for an FBA business, so this is a solid amount. This product clearly shifts a lot of units, almost 9,000 in one year, and despite the high order fees, it’s generating a handsome profit, all of which is going to charity. Jungle Snugs is selling hundreds of units per month, and it’s growing nicely. Sales are looking good for Q4 as this product does make for a nice gift. 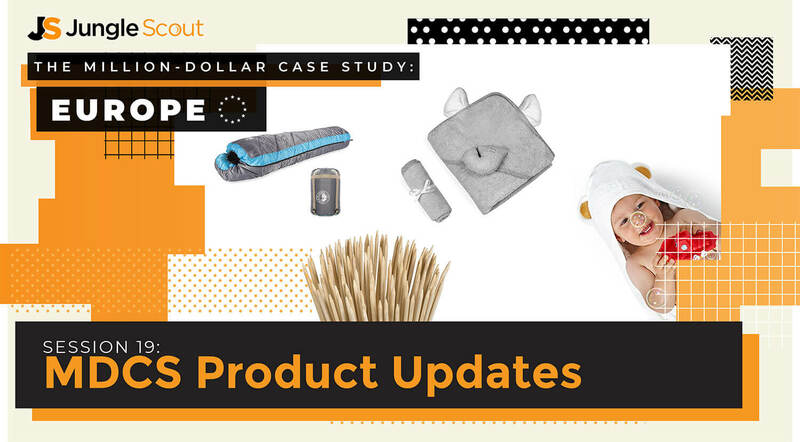 Especially with the Jungle Snugs, more eyes on the case study meant that there were a lot more competitors entering the market alongside us than when we launched Jungle Stix. Greg mentions that there were around 30 other sellers of this product entering the market, which does change the competitive landscape. But overall, the snugs are still doing well. I was surprised that the pink variation performed best because I presumed that gender neutral baby gear was all the rage. But as it turns out, we’re one of the only people selling a pink one on Amazon and therefore our pink snugs does really well. We also recently launched a gray elephant variant, after spotting some keyword trends. It was pretty easy to order a new variation with our existing supplier and the sales from this should increase our Snugs revenue some more! My sleeping bags are going to be launching early 2018 so there are no sales to report… yet! I took a look back at my original research, and also had a peek in my Web App product tracker (because I am still tracking my soon-to-be competitors in there) to see how sales for sleeping bags have progressed in the UK. Top sellers are generating £2.5k – £5k in revenue per month, so in dollars that means that my sleeping bags could be adding up to $6.7k in revenue per month to our growing business. 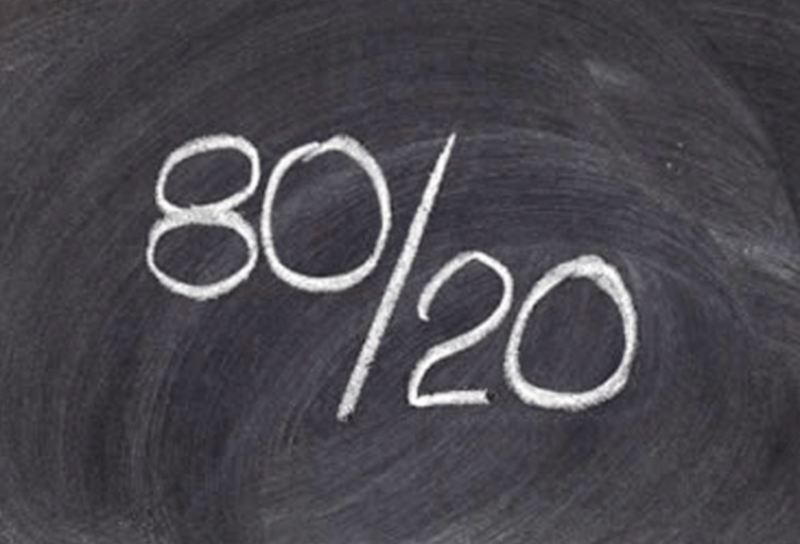 The 80/20 Pareto principle that 20% of the work you do makes up 80% of the results! This can be applied to Amazon selling too. Most Amazon sellers with several SKUs will find that a small percentage of their products sell really well, and the rest will make up the remaining 20% of their business revenue and profit. This definitely rings true with our case study so far, but that doesn’t mean that those products that sell less are not valuable. 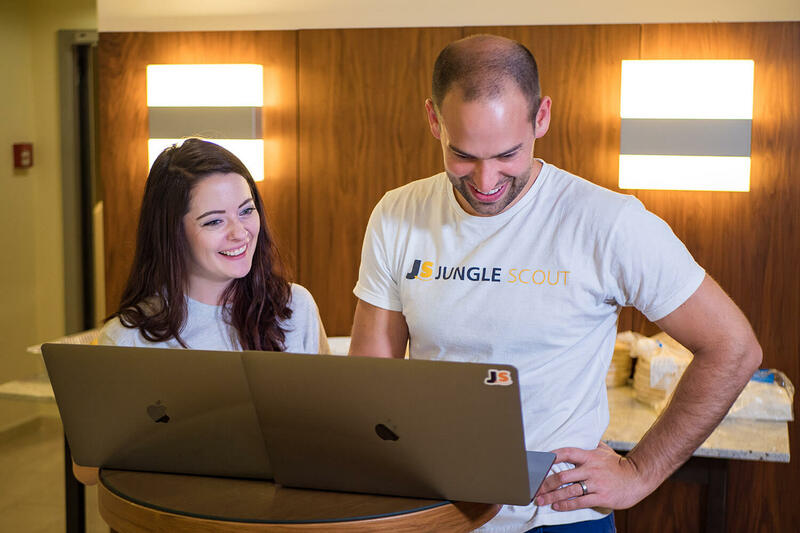 Jungle Snugs still bring in a significant amount of money and it’s a great asset to diversify with different product SKUs so that you aren’t relying on just one product. It’s just important to understand this about your own products, and not to be discouraged when not every single product sells as well as the last. Greg added that one of the big reasons for this with our products so far is that with Jungle Stix, we got into that niche quite early in terms of the competitive landscape and rooted ourselves with a great listing, built up reviews and secured a good ranking. So if you take anything away from this message it’s that your product research is extremely important when it comes to finding your top selling products that will bring you the most profits. If you find these high demand opportunities with low competition, then your chances of finding winning products are multiplied! Launched 3 products and 7 SKUs in two marketplaces – well almost, when the sleeping bags launch, but the point it we have scaled the business nicely, and are taking advantage of a new marketplace. Returns rates are all below 3% – customer support is important for an Amazon business too, and it’s crucial to ensure that your product is well received by your customers. A benchmark we set for returns is 3% and all of our SKUs are below that mark, with Jungle Stix having returns rates as low as 1%. Running out of stock / inventory management – OK so we always tell you how important this is, but sometimes life comes at you fast and you run out of stock. We can definitely be more proactive in preventing this in the future. Jungle Stix only went out of stock once this year (compared to a few times last year) and this has definitely been an improvement. Need to be more proactive with admin tasks – It’s easy to be complacent when you have become a seller and you’re launching your second or third products. We were too slow to apply for a Europe Seller Central account thinking it would get approved in a day or two like they often are in Europe, but this wasn’t the case and it slowed us down. It’s important to stay on top of those admin tasks you really don’t want to do to keep things running smoothly. Spend more time on updating listings & optimization – Updating our listings, getting new photography, split testing with Splitly. These are all things we could be doing more of, especially now our first two products have settled into the market. The competitive landscape can change, and it’s important to stay on top of your game! In Greg’s opinion you need about $2k to launch a private label product. Some people do it with less, some people do it with more. There are a few things that you definitely need to invest in up front, like inventory, and other things that can be “nice to haves” until you have the cashflow in your business. You can read more about this in this post here. The main thing is to launch where is easiest for you and this can vary depending on where you are from, where you are based, and even what languages you know. The US is still the largest marketplace, and there are still a lot of opportunities there. But other marketplaces are growing fast. As mentioned, part of the reason Jungle Stix does so well is because we got in there at a prime time to be competitive. That is why launching in these growing marketplaces is so interesting to existing and new sellers right now, because all of these marketplaces are ripe with opportunity. Greg explained this one really well. In short, yes… and no. There are upfront costs associated with launching a private label business, and some of them include marketing costs. For example, if you need any design or photography then those would be upfront costs. However, when it comes to the most common marketing costs like PPC and running promotions to launch a product, those aren’t costs where you will need to put in cash upfront. Remember, by this point you have already purchased your inventory and you are going to start making sales. So these marketing costs do affect your cashflow and it’s very important to understand them, but they don’t require you to put in extra money up front. We see these costs at the beginning as an upfront investment for long-term success. So you may make less money, or no money at all on some of your first sales, but in the long run it will ensure you make up for it and then some with a successful product. I have learnt a lot from going through the full launch process, with mentoring from Greg and industry experts, and I hope that you have been able to follow along and learn with me. It’s not over until we hit $1 million! What do you want to hear about the most? Let us know in the comments below. We will let you know about all future Million Dollar Case Study updates. Until then, thanks for joining! Have you considered using different baby models for the snugs? As a shopper I personally would love to see non-white babies as all of the photos on Amazon seem to be of Caucasian blue-eyes babies. Having different races for the different iterations would be adorable and create so much added interest. Diversity is huge in marketing – I feel like this could be a huge distinction for the products. Am I missing something? It probably came down to the photography company we sent the products too (Kym doesn’t actually have a baby of her own haha). But in the future, we will definitely aim to diversify a lot more! To add some input, this million dollar case study has been great to learn from. As Greg mentioned in the call, I’d like to see more case studies on the next marketplaces like Japan, Australia, China, India, Etc. How long has it taken you to get verified to sell on Amazon UK ? It actually did take quite a while with lots of back and forth with Amazon, requesting paperwork and information. I actually think it took about a month to get it approved which was super frustrating, but we got there in the end with perseverance. Can you give your opinion how (if) New EU General Data Protection Regulations will affect Amazon sellers? I assume you mean the new GDPR that is coming in later this year? I believe that big businesses will be the first to be affected or penalized… so I think we can be confident that Amazon (and specifically, Amazon Europe) will adhere to the new regulations. As a seller, you are using their platform to make sales and collect customer data, so that gives you one less thing to worry about. I think there are a lot of scary things in the news about this but it’s not something us sellers should be worried about right now. That’s just my take on it – would love to hear if anyone has any insights on this too! I just checked your listing, it seems you removed pink towels. As it’s the best sales of the 4 variants, may I know why you did so? Hey Vincent – indeed they were the best seller, which we think is because our competitors were not offering a similar item in pink. Unfortunately we are out of stock. This is something we always advise sellers to avoid (a stock-out). Right now we have to wait for more to come back into the fulfillment center, at which point we will likely have to do a “relaunch” to get our BSR (ranking) back up. So what is “relaunch”? Is it something like removing the old listing and building a new one? Then you have a brand new listing which allow you make a new & strong sales history for ranking, right? You don’t need to remove your listing… but when you have been out of stock your rank will take a huge blow. So we would employ the same tactics we used to launch the product initially to get our sales velocity (and rank) back up. Hi Kim. You can send me a template for products. Excel. I read from scratch and can not be downloaded anymore. Hello, when is the next update for this case study? Kym, myself, and rest of us just got back from Bangkok with a ton of new insights. Kym should have a post together and up very soon… we’ll keep you posted! Greg always aims for ROI on the landed cost of over 100% (so that’s on his initial investment of the cost of goods). This is something he calculates prior to launch with the initial profit calculations. Return on Investment = (Sales – Total Expenses) / Total Expenses. So one is based on landed cost / investment, and one is based on total expenses. 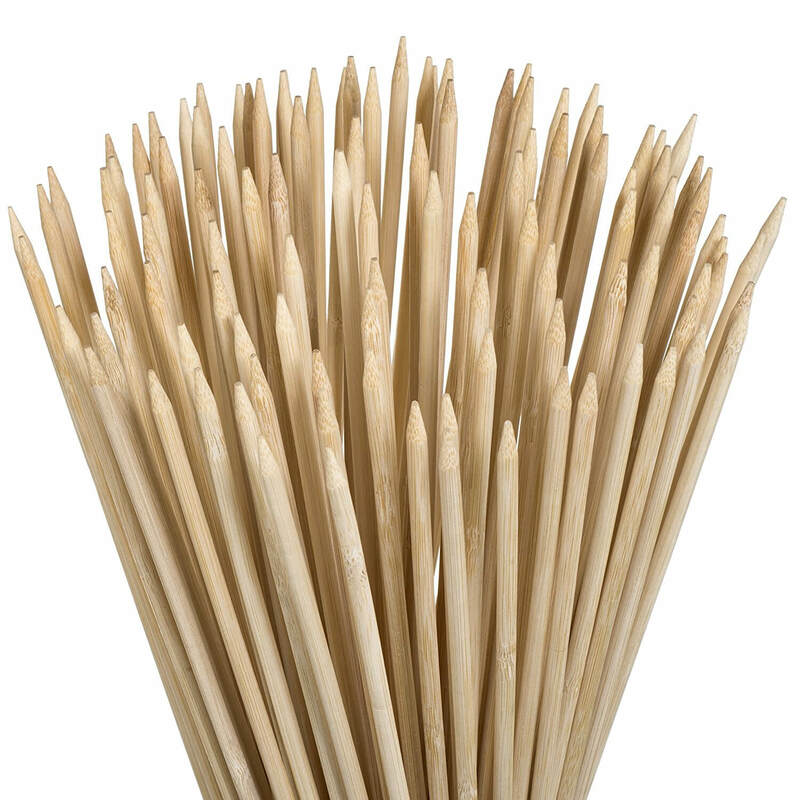 Given the ‘oversize’ of the Jungle Stix, is the ‘Fulfillment By Amazon Fee’ the only fee that is going to be higher. Or will there be any other fees, such as oversize storage fees, etc. that I should factor into my profit calculations.